August is the month when the Elk River in the East Kootnays runs clear and is in perfect dry fly condition! Strong stubby Montana cuts cruise the gin clear water and slash vigorously at the evening fly hatches. A little work is required to get away from the pools near the main highway but the rewards are ample when the cutthroat trout so willingly take your dry fly offering. I prefer a hair wing fly tied with white kip tail for the wing simply because it is easier to see the float of the fly as it bounces through the ripples. Those short but very thick cutthroat do not seem to mind this deviation in the least! A dab of floatant is necessary to insure your fly will cockily float through the runs and prove irresistible to those river trout! Hook : Size 8 to 14. Body : Peacock herl over wrapped in the centre section with red floss. Hackle : Grizzly or brown saddle. Wing : White kip's tail. Tie in a short tail of grizzly or, perhaps a little more appealing to many fishermen, red pheasant. Next wrap the hook shank with peacock herl and then over wrap the centre section with red floss. White kip's tail is then used to make a vertical wing that projects upward at least equal to the length of the hook shank. This greatly increases the visibility of the fly on the water. The final step is to wind a brown saddle hackle several turns just behind the kip tail wing. Mustad dry 94842. 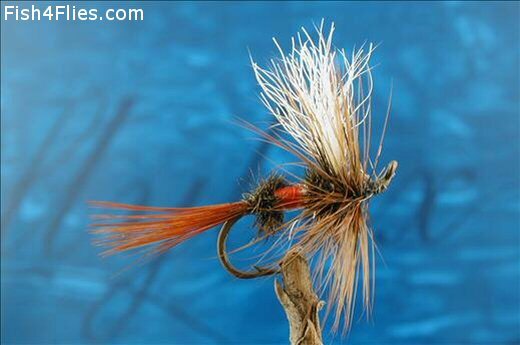 Currently there are no comments about the Hairwing Coachman fly pattern from other fly fishermen yet.